There is nothing more disturbing than discovering you have bats roosting in your attic or other areas of your home uninhabited by humans. Whether you hear them rustling throughout the night, or have encountered one that has mistakenly found entrance into your home, you want nothing more to have them gone and not a moment too soon. You Google, “How to get rid of bats in my house,” and a list of “do it yourself” solutions flood your page. You’re bombarded with information. You are not a biologist, you do not know your local wildlife laws, you are not a carpenter, and now you’re scared of contacting some zoonotic disease. Its now approaching midnight and you stumble back to bed ready to tackle the situation in the morning. Morning comes too soon because you had a restless nights sleep and you start reading about mothballs, mylar balloons, strobe lights, essential oils, and much much more. Unfortunately, as creative as the do it yourselfers get, they are very wrong when it comes to ridding your home of bats. The only way to effectively, and legally exclude bats from your home is to hire a seasoned professional even if you consider yourself more than handy. Tri State Wildlife is your go to company for all of your wildlife exclusion needs 859-635-0037. 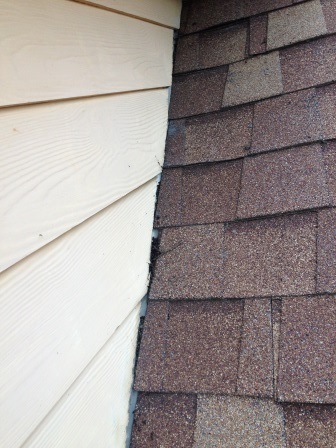 The number one reason to hire a professional for getting rid of bats is peace of mind. 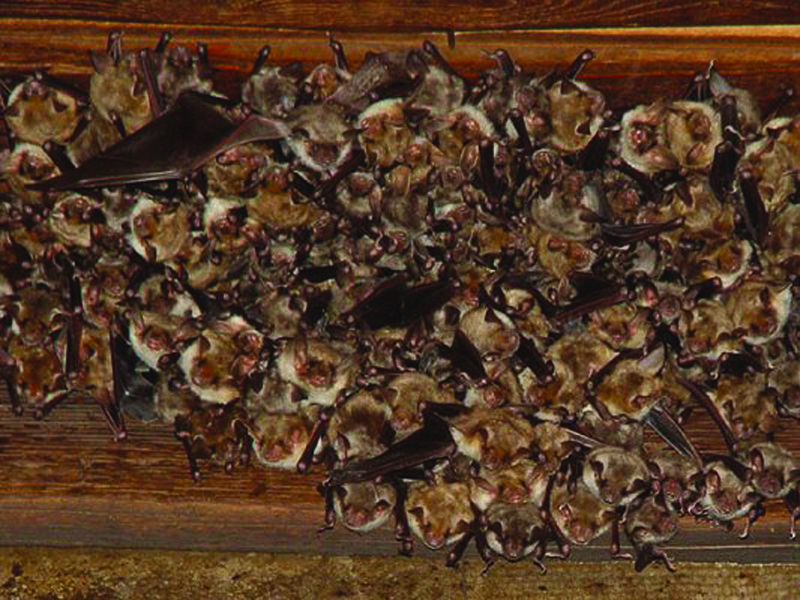 Tri-State Wildlife’s technicians are thoroughly trained in bat eviction/venting procedures and educate their customers regarding the best solution to rid their property of a bat invasion. The process starts with a detailed inspection of the property designed to identify structural defects, as well as current and potential bat entry points that lead into the interiors of the structure. Even if you know where the bats are entering most bat colonies have multiple entrances into your home as well as areas that could easily be established as an entrance. The inspection is intended to assist in the evaluation of the overall bat colony within the building and offer our clients the best possible approach. In addition, to our detailed inspection Tri State Wildlife is more than happy to help put our customers minds at ease. In addition to removal/exclusion services, Tri-State Wildlife also offers full and partial attic cleanouts. Tri State Wildlife employees are trained in safe and effective methods of removing bat guano and contaminated insulation. Due to the risk of exposure to diseases such as histoplasmosis proper protective gear and equipment is vital to a safe and effective cleanout. If you or someone you know is experiencing a problem with bats in their home or structure give Tri State Wildlife a call today, 859-635-0037. Late winter/early spring is a great time to get started on the bat eviction process. Warm weather has been sporadically infiltrating the tri-state area the past couple of weeks so use it to your advantage to become one of the firsts in the area to rid your home of bats this season. Will Bats Fly During a Solar Eclipse? Call Tri-State Wildlife Management for Professional Bat Removal Services in Northern Kentucky and the Greater Cincinnati area 859-635-0037. Serving Northern Kentucky and Greater Cincinnati. There have been a lot of articles circulating online in regards to the solar eclipse and the strange phenomenon that will occur during this time. Vets and animal experts are advising to keep pets indoors to protect there eyes from permeate damage. However, this leads one to wonder how wild animals will react to this rare occurrence. One article in particular on knowledge news states that it is “difficult for scientist to say conclusively how much the moon blocking out the sun’s rays has affected animals over the years since the events are always so brief. Despite this limited observation window there have been odd behavior observed in insects, birds, and mammals such as chimpanzees, cows, and giraffes. With all of the unknown about animals and their reaction to the eclipse it started me thinking about whether or not traditionally nocturnal animals will suddenly become active. More specifically whether or not bats will leave their roost and fly during a solar eclipse. One thing to consider when pondering this concept is an animals typical cycle of activity. Most people are familiar with diurnal (active during the day) and nocturnal (active at night), however most people are unaware of the term crepuscular. Crepuscular is derived from the Latin word for twilight and describes animals that are primarily active during dusk and dawn. Rabbits, deer, skunks, opossums, and the common house cat are some of the most commonly known crepuscular animals that we have in this area. Uniquely enough these animals are also known to be active on overcast days and moonlit nights. Therefore, one might observe more active behavior from these animals during such an occurrence as a solar eclipse. Since we are in the heart of bat exclusion season, and juvenile bats have finally started leaving the roost, one can only wonder if these irresponsible teenagers will attempt to leave the roost during the day of a solar eclipse. Will bats fly during a solar eclipse? According to Chris Smith, of the Naked Scientists based out of Cambridge University, bats like humans and many other mammals have an internal clock that allows them to fall asleep and wake on a pretty predictable cycle. “It’s called the suprachiasmatic nucleus and that keeps time. It is a few thousand nerve cells, maybe 20,000 nerve cells that are all interconnected and they are running a genetic program. This molecular clockwork takes about 24 hours to go round a complete cycle.” “So these nerve cells become more or less active and they secrete various hormones into the blood stream, and they go round the body and inform all of the tissues in the body that have their own body clocks, what time it is. So you have this master clock in your head and you have these other slave clocks – if you like- in every cell in your body. That’s how your tissues know what time of days it is.” According to Chris some animals, such as bats, have their clocks reversed. Causing them to awake during twilight/dusk and retreat to bed at dawn. In addition to a bats internal clock, bats also use the sun, moon, and the earths magnetic field to navigate. “They know where the moon is, and they know where east and west is, because they know where the sun is setting and they know where it is rising and they set their body clocks with the earth’s magnetic field as well. So they have a magnetic response element in their brains, they look at where the sun is in the sky. They then know that the sun rises and sets east and west. They know what time it is in their body clock and they lock their body clock onto the magnetic signal of the earth, and they know which direction to fly.” Further more, according to one researcher if you make a bat “jet lagged” by interrupting their cycle and exposure to light and dark they can actually fly off in the wrong direction. After my readings I think I am going to be more interested in the wildlife around me than the solar eclipse. I hope to catch the deer and rabbits running through the back yard, and maybe a few bats flying through the sky. Either way it’s going to be an interesting day. Tri-State Wildlife Management is committed to helping wildlife and people live communally while protecting you, your health, and your property. If you are currently experiencing a bat issue in your home or property, please give us a call at 859-635-0037. Posted in Bats, Uncategorized | Comments Off on Will Bats Fly During a Solar Eclipse? Northern Kentucky Bat Removal Specialists. The news media is often guilty of sensationalizing stories about rabid bats or bat colonies in buildings and the dangers involved; however, like many native wildlife a very small percentage of bats contract rabies and of that small percentage, an even smaller percentage will come in contact with humans or pets. With that said, it is always wise to practice common sense and use caution around them and avoid direct contact, as well as ensure that your pets are properly vaccinated. Bat bites and other physical contact may go undetected by individuals who are asleep, children and pets. In recent years there has been an increase in the percentage of bats testing positive for rabies. In addition to the foul smell and unsanitary conditions, accumulated bat droppings can support the growth of histoplasmosis, an airborne fungal disease very common in the Tri-State area. Dry attic environments usually do not support the growth of histoplasmosis spores, however attic clean outs should never be conducted by a home or business owner! Many experts agree that the safest guano is undisturbed guano. Due to the risk of exposure during extraction, guano removal should be left to trained professionals with the proper, safe and removal equipment. We strive for the most humane and environmentally effective techniques for dealing with bat and wildlife problems. Tri-State Wildlife Management’s use of modern innovative methods provides sound wildlife management services to ensure the protection of our customers’ investments and health. Tri-State Wildlife Management is fully insured, and we stand behind all of our work. For Northern Kentucky Bat Removal, or Bat Removal in Ohio, or Indiana, call Tri-State Wildlife Management! (859) 635-0037. Call Tri-State Wildlife Management for Professional Bat Removal Services in Alexandria, KY. 859-635-0037. Serving Northern Kentucky and Greater Cincinnati. Bat Removal Alexandria, KY: Bats are found worldwide and include about 900 species; however, there are only 40 species living in the United States. The Greater Cincinnati area typically only deals with two types of bats; the little brown bat and the big brown bat, although Indiana bats are also native to the area they are very rarely found in dwellings. Bats are nocturnal and tend to be rather shy. Because of their habits and old superstitions, people seem to have more fear of bats than they need to. Both the little brown bat and the big brown bat are dark in color and live in colonies. Roosting in attics, wall spaces, chimneys, siding, shingles, behind shutters, barns and in between tree bark is all common. All attics if not sealed properly run the risk of needing bat removal. Adult bats breed in the fall and bear their young May through July. Little brown bats usually have one pup while big brown bats typically have two. Weaning occurs in July and August when the young are old enough to fly. It is during this time that juvenile bats often mistakenly find their way in to living quarters. As a general rule, in our area, big brown bats tend to be year-round residents, while little brown bats may stay or leave the area to hibernate. Bats become a nuisance when their close proximity to humans brings them into living areas during season changes. Many times, however, homeowners may have bats in their home, but do not realize it until one or two accidentally find themselves in the living space of a house or basement. Another way that homeowners realize they have “bats in the belfry” is when a noticeable pile of droppings known as guano is found lying on the ground or windowsill alongside the house. Above this pile, usually up in the soffit area or attic vent area, there is a hole for entry and exit. When bat guano and urine build up in an attic or wall space, the smell gets very strong –this is one more indicator of bat presence in a home. Bats present a danger because they are a carrier of rabies and their guano can lead to a lung disease called histoplasmosis. Exclusion is important because of these threats. For this reason, TSWM also offers full attic clean outs with sanitizing and deodorizing. 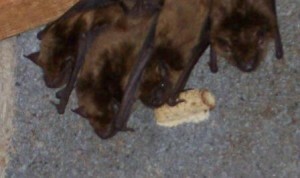 Because of the pups’ inability to fly out, TSWM cannot remove bats between mid-May and mid-August. This is crucial information when excluding bats from your residence. Due to expanding human populations reducing wildlife habitat, and humans creating more comfortable habitat, many species of wildlife at one time or another require management actions to reduce conflicts with people, property, and pets or with other wildlife species. In many cases wildlife species have found a way to co-exist with their human neighbors. Sometimes conflicts do arise and action is needed to protect the wildlife, humans, pets or property. TSWM’s goal is to alleviate the problems that sometimes occur where wildlife and humans co-exist by providing information for homeowners to make good decisions to deter wildlife whenever possible. M Sometimes wildlife needs to be removed when no other solution can be reached. Tri-State Wildlife Management is your full service Bat Management Specialist, offering bat exclusion , repair, and attic cleanups. Nationally Certified Bat Standard Compliant. 859-635-0037 Call Today! The news media is often guilty of sensationalizing stories about rabid bats or bat colonies in buildings and the dangers involved; however, like many native wildlife a very small percentage of bats contract rabies and of that small percentage, an even smaller percentage will come in contact with humans or pets. With that said, it is always wise to practice common sense and use caution around them and avoid direct contact, as well as ensure that your pets are properly vaccinated. Bat bits and other physical contact may go undetected by individuals who are asleep, children and pets. In addition, to the foul smell and unsanitary conditions, accumulated bat droppings can support the growth of histoplasmosis, an airborne fungal disease very common in the Tri-State area. Dry attic environments usually do not support the growth of histoplasmosis spores, however attic cleanouts should never be conducted by a home or business owner. Due to the risk of exposure, guano removal should be left to trained professionals with the proper safe and removal equipment. At Tri-State Wildlife we strive for the most humane and environmentally effective techniques for dealing with bats in your home or business. Tri-State Wildlife Management’s use of modern innovative methods provides sound wildlife management services to ensure the protection of our customers’ investments, property and health. Tri-State Wildlife Management is fully insured, and we stand behind all of our work. We have an A+ rating for a reason and strive to provide our customers with the best service in the Cincinnati Tri-State area. 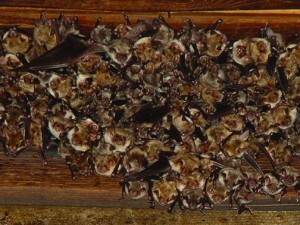 Bat Removal Erlanger, KY (41018): Bats become a nuisance when they roost in large numbers in houses and businesses. Despite their usefulness, discovering or even suspecting bats living in your home or business is unsettling. Due to the breeding and roosting habits of bats, timing the removal of a bat colony is crucial to both the success of the exclusion as well as its legality and therefore best left to the experts. Bats often enter the occupied spaces of businesses or residences due to their roost being in close proximity to open windows, doors, and attic access. 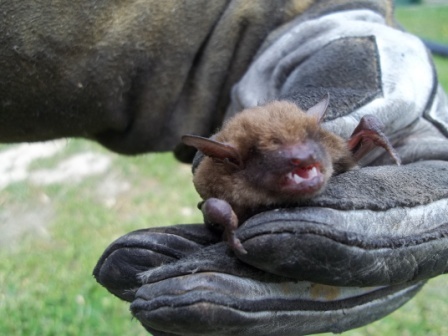 Tri-State Wildlife Management’s technicians are thoroughly trained in bat eviction/venting procedures and educate their customers regarding the best solution to rid their property of a bat invasion. The process starts with a meticulous inspection of the property designed to identify structural defects, as well as current and potential bat entry points that lead into the interiors of the structure. The inspection is intended to assist in the evaluation of the overall bat colony within the condition of the building. In addition to removal/exclusion services, Tri-State Wildlife Management (TSWM) also offers full and partial attic cleanouts. TSWM employees are trained in safe and effective methods of removing bat guano and contaminated insulation. Due to the risk of exposure to diseases such as histoplasmosis, proper protective gear and equipment is vital to a safe and effective cleanout. TSWM is committed to working with home and business owners to eradicate their nuisance wildlife issue. The courteous staff at Tri-State Wildlife will work for you to provide a cost effective solution to your bat or wildlife intrusion and/or damage issue. As a full service company we will initiate an Integrated Management Plan beginning with an inspection and customer education followed by bat removal and exclusion of intrusive bats or wildlife, clean-up, repair/restoration and prevention. We strive for the most humane and environmentally effective techniques for dealing with bats and wildlife problems. Tri-State Wildlife Management’s use of modern innovative methods provides sound wildlife management services to ensure the protection of our customers’ investments and health. Tri-State Wildlife Management is a full service company. In addition to your bat issue, TSWM offers bird and wildlife damage repairs, installs custom and standard chimney caps, seals homes and businesses to prevent wildlife from entering, removes bird, bat, and raccoon droppings and debris from attics, installs barrier fencing, removes dead animals and MUCH MORE. Taylor Mill, KY Bat Removal (41015): Tri-State Wildlife Management is currently excluding bats from homes in northern Kentucky. Typically, homeowners realize they have bats living in their attic when they see bats exiting their home, or when they spot bat droppings on their home or close to it on the ground. A bat may escape into the living space of a home, which also may be an indicator you have bats living in your attic. Bats that stayed in the area over the winter are now venturing out to feed, and bats that migrated south are returning. The mild weather gives bats the opportunity to leave the warmth of your home, just as the warmer weather has encouraged many people to rest, work, and play outside. Many people are outside in their yards or relaxing on their deck or porch around dusk, which is also the time that bats leave their roost to feed on bugs and insects. If their roost is in your attic, you may see them taking off from your home and feeding in the surrounding area. Having bats in your home is an unsettling and serious problem, even if they are confined to the attic. Not only do they urinate and defecate anywhere they roost, causing staining and odor problems which are difficult to remove, they are associated with diseases which are dangerous to humans, including rabies and histoplasmosis (a lung disease caused by the spores of fungus which grow on their droppings or guano). While bats are very beneficial to humans because of their affinity for many flying insects, such as mosquitoes, if they find their way into your home and take up residence, they can also be some of the most destructive, dangerous, and expensive wildlife to control. 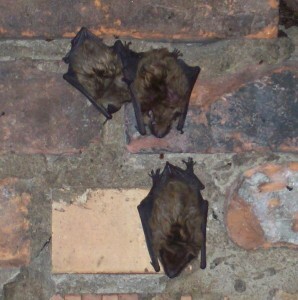 Since bats are a protected species, removal should be done by a trained professional, such as our trained technicians. In addition, we perform repairs and/or restorations to your home or business to prevent re-entry. 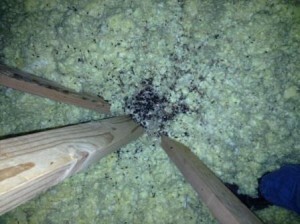 TSWM also offers partial and full attic cleanups after bat exclusion. Now is the perfect time to rid your home of bats. Once females begin giving birth to young (usually mid-May), full bat exclusion work must be put on hold until all juveniles are old enough to fly (usually mid-August). Although partial repairs of at risk areas can be completed during this blackout period, Tri-State Wildlife Management is not ethically or legally able to exclude bats from your home. Tri-State Wildlife Management is Certified Bat Standard Compliant by the National Wildlife Control Operators Association. Bat Removal 41011 – Bats Series Part 3: Damage and Damage Identification Tri-State Wildlife Management continues to receive many calls from people in the Tri-State area who are realizing bats are taking up residence in their home or business. This is also the time of year when the technicians at TSWM are able to exclude bats, repair damages, and prevent re-entry on homes and other structures. Damage and Damage Identification Bats become a nuisance when they roost in large numbers in houses and businesses. Despite their usefulness, discovering or even suspecting bats living in your home or business is unsettling. Two common bat problems in the Greater Cincinnati Northern Kentucky area include a solitary bat accidentally entering the living space of a structure and bats roosting in the attics or chimneys of homes or building. Signs that bats may be living in a structure include seeing bats going in/out of the building, and the presence of bat droppings (guano). TSWM also offers full and partial attic cleanouts. TSWM employees are trained in safe and effective methods of removing bat guano and contaminated insulation. Due to the risk of exposure to diseases such as histoplasmosis, proper protective gear and equipment is vital to a safe and effective cleanout. TSWM is committed to working with home and business owners to eradicate their nuisance wildlife issue. Bat Removal 41011 – For Bat Removal and Exclusion Services in Covington, KY or anywhere in NKY/Cincy/SEI, call Tri-State Wildlife Management at (859) 635-0037. Bats Series Part 2: Disease Tri-State Wildlife Management continues to receive many calls from people in the Tri-State area, including Covington, KY, who are realizing bats are taking up residence in their home or business. This is also the time of year when the technicians at TSWM are able to exclude bats, repair damages, and prevent re-entry on homes and other structures. Due to the large number of bat encounters this time of year, Tri-State Wildlife Management will be posting a blog series devoted to educating the public about bats. The second part in this series provides information on bat diseases and their potential health risk to humans. Disease The news media is often guilty of sensationalizing stories about rabid bats or bat colonies in buildings and the dangers involved; however, like many native wildlife a very small percentage of bats contract rabies and of that small percentage, an even smaller percentage will come in contact with humans or pets. With that said, it is always wise to practice common sense and use caution around them and avoid direct contact, as well as ensure that your pets are properly vaccinated. Bat bites and other physical contact may go undetected by individuals who are asleep, children and pets. For Bat Removal and Exclusion Services in Covington, KY (41015) or anywhere in the NKY/Cincy/SE IN area, call Tri-State Wildlife Management at (859) 635-0037. Bat Removal Covington, KY (41014) – Bats Series Part 1: Synopsis and Biology Tri-State Wildlife Management continues to receive many calls from people in the Tri-State area who are realizing bats are taking up residence in their home or business. This is the time of year when the technicians at TSWM begin the preliminary bat exclusion process so when final exclusion is permitted, the job is completed more quickly and easily. Due to the large number of bat encounters this time of year, Tri-State Wildlife Management will be posting a blog series devoted to educating the public about bats. The first part in this series gives a brief synopsis as well as bat biology information. Bat Synopsis Bats may be the most misunderstood animals in the United States despite their ecological value. Regardless of their usefulness as the primary predators of night flying insects such as mosquitoes, bats suffer from a bad public image throughout much of the world. Centuries of myths, superstitions and misconceptions lead to fears of dread associated with such characters as Count Dracula and lead to bats being killed simply because they live near people that fear them. Despite their reputation, bats are not aggressive and usually wish to avoid humans. Bat populations the world over are rapidly declining leading to strict implementation of conservation efforts to protect bats and their habitats. Biology Bats are mammals, having hair, giving birth to living young, and feeding them on milk from mammary glands. They are the only mammals that truly fly and are often seen fluttering around dusk, using their amazingly developed echolocation system (or sonar) to navigate through the night sky and locate and capture insects. More than two-thirds of bat species hunt insects in this way. It is said that a single little brown bat can eat up to 1,000 mosquito-sized insects in one hour, while a pregnant or lactating female has a large enough appetite to eat the equivalent of her entire body weight in a single night. There are over 900 species of bats around the world with the majority of them residing in the tropics. Bats are second only to rodents in numbers among mammals and comprise almost one-fourth of all mammal species. The Cincinnati Tri-State is home to only a fraction of these bats, with the most common being the little brown bat and the big brown bat. For Bat Removal and Exclusion Services in Covington, KY (41014) or anywhere in the NKY/Cincy/SE IN area, call Tri-State Wildlife Management at (859) 635-0037.